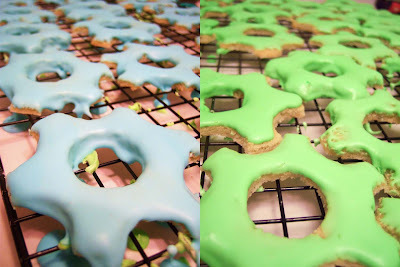 om-noms by kelly: Cog Sugar Cookies! These are the toppers for my upcoming robot cupcakes! They're cog-shaped sugar cookies that are iced with royal icing (made with meringue powder because raw egg whites scare me). First, of course, I rolled out the sugar cookie dough on a mat since my table is tiled. My first batch, I had cut the cog shapes out and put them on the cookie sheet. I pulled them out of the oven and they looked like flowers. So, I had to end up cutting the cog shapes out of the cookies once they were baked. Therefore, every batch after the first was just circle cookies. Cutting the circle shape out of the baked cookies. Cutting the centers out of the cookies with a petit four cutter (it was the only circle cutter I could find that was small enough). Cutting the teeth out of the sides with the petit four cutter. I used the dip method to ice the cookies with royal icing, since it seemed easiest as I was only using one color for the whole cookie. I dipped the fronts of the cookies in the icing, then pulled them out and set them on a rack to dry. Now all I've got left to do is make, frost, and assemble the cupcakes! Mix all together until smooth. This version is best for using the dip method to ice cookies. There are thicker versions that are better for piping. Kelly, I just found your blog again. The ROBOT cupcakes were so good and a lot of work went into them. You are so talented. OMG! You're a lifesaver! I can't believe that I never thought of using another smaller round Cookie Cutter to make the teeth of the gears! I've been trying to make a steampunk Cake for a class I'm in at school and I haven't found anywhere that makes gear shaped cutters, cause I can never cut the gears the way I want them to look! Kudos to you! I used this method to make edible steampunk cupcake toppers and I am really pleased with the results. I included your blog link in my post acknowledging where the idea came from.